ASTANA. KAZINFORM - Kazinform's Timeline is the one-stop shop where you can learn about historical events for the 11th of January. 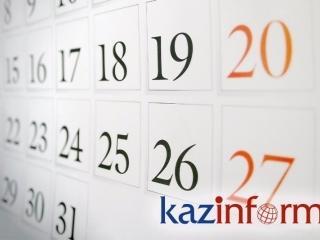 See what notable events happened throughout Kazakhstan's history on January 11. Reelected on 4th December 2005, Head of State Nursultan Nazarbayev, officially assumed office as the President of the Republic of Kazakhstan in 2006. The inauguration ceremony was held in the Ak orda presidential residence. The same year, the song Menin Qazaqstanym was performed for the first time as the national anthem during the swearing-in ceremony of President Nursultan Nazarbayev. It bears to remind that Nursultan Nazarbayev is a co-author of the lyrics to the anthem of the Republic of Kazakhstan. In 2011, Bolat Sharipov's documentary Okiletti Yelshi (Ambassador Plenipotentiary) about the first Kazakh professional diplomat Nazir Torekulov, the first USSR ambassador in the Islamic world, was made. The documentary attempted to tell contemporaries about the prominent statesman, whose achievements were not duly acknowledged in his time. In 2013, gymnasts of Astana circus Dariya Abdukhassova and Dana Rysspekova won the Grand-Prix of the International Circus Festival - the Golden Clown award. Our gymnasts competed with the world's best circus performers in Enschede, the Netherlands. A working group on the issues of redistribution of powers between the government branches was formed by the decision of the President of the Republic of Kazakhstan in 2017. The Head of the Presidential Administration led the working group. It included representatives of the Parliament, the Government, the Supreme Court of the Republic of Kazakhstan, other government authorities, as well as representatives of legal and scientific expert communities. Prominent Russian scientists and economics were awarded with jubilee medals dated to 25 years of Kazakhstan's Independence in 2017, namely rector of the Moscow State University Viktor Sadovnichiy, President of the Russian Goods Producers Union Oleg Soskovets, and well-known public figure Tair Mansurov.